Cardiff Devils coach Andrew Lord says his team can bounce back in the Ice Hockey Elite League play-offs after missing out on a third consecutive regular season title. A "gut-wrenching" 3-1 loss at Coventry Blaze saw Cardiff miss out on the point they needed to finish top of the table. They now face Sheffield Steelers in a double-header on 6 and 7 April. "We've got more than enough character to come back strong next weekend," Lord told BBC Wales Sport. "It's an absolutely gut-wrenching feeling, it's really hard to even put into words and explain it. "You work nine months day-in and day-out and to lose on a tie-break it's just brutal." Devils won the regular season title and the play-offs in 2018 - beating Sheffield 3-1 in the grand final. 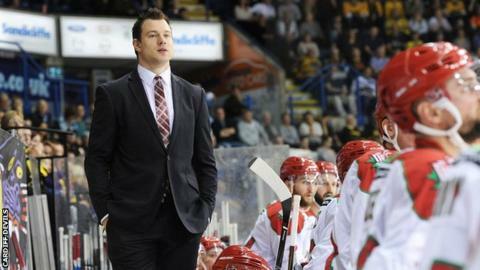 Lord believes believes his team has the character to recover after Belfast Giants topped the regular season table. "It's what defines you as an athlete and as a person," added Lord. "We've got a heck of a hockey team here. We've played so much quality hockey all season long and it's just getting that first goal and that first period is critical for us."